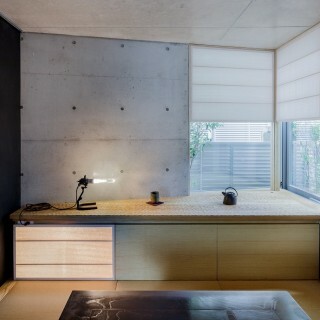 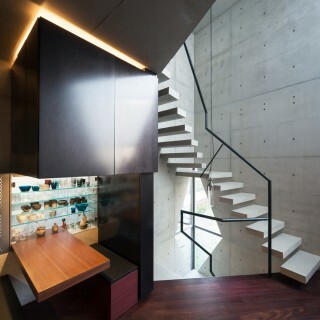 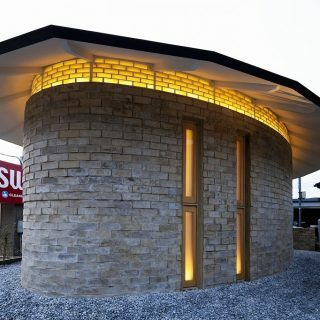 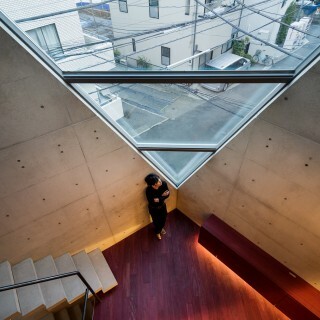 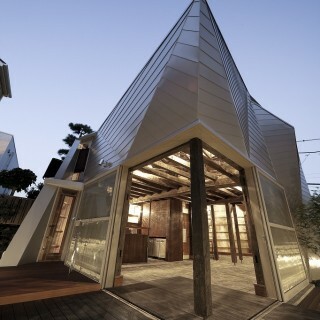 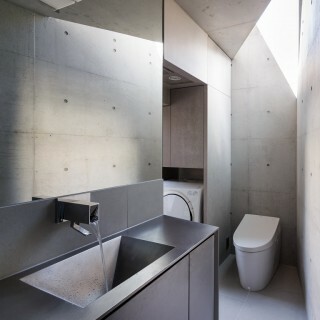 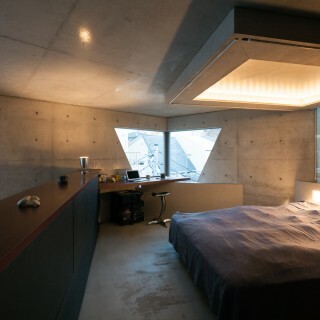 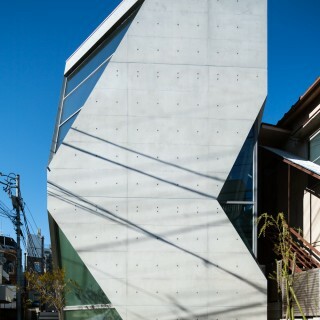 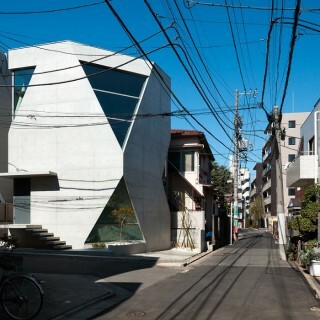 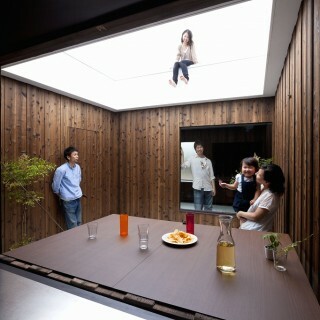 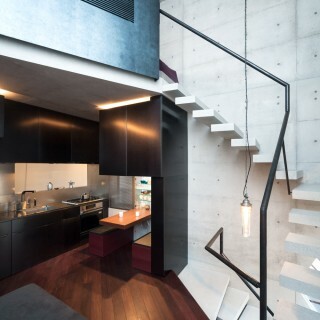 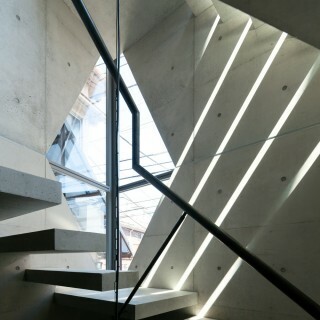 This house is located in the center of Tokyo, on a site area of mere 66㎡. 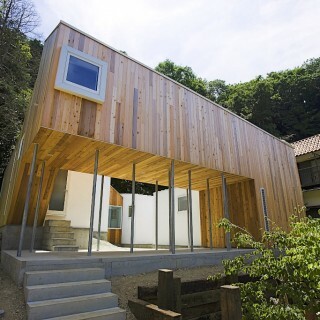 The clients are a married couple both working in the field of chemistry, sharing a passion for architecture and art. 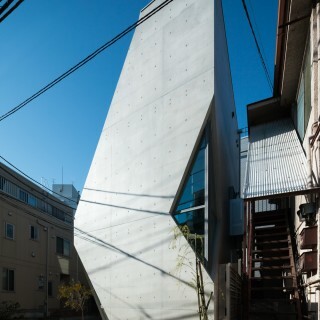 “We want to see exposed concrete finish inside and out. 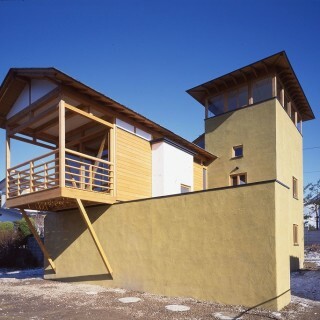 A distinctive piece of architecture that is at the same time environmentally conscious.” These were the initial request of the clients. 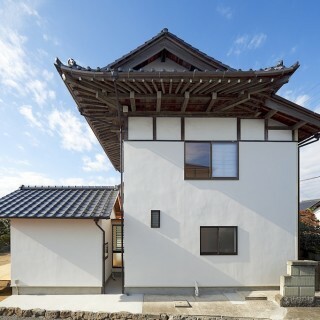 With those words as a starting point, we conducted various studies and researches and the house saw its completion after two and a half years. 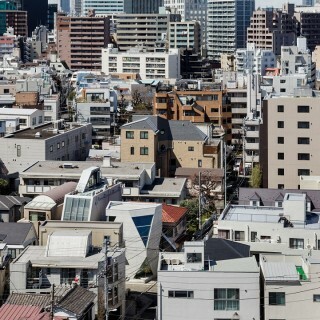 The way of building architecture respectfully towards nature and the environment in high density residential districts in Tokyo is to build towards the “sky”. 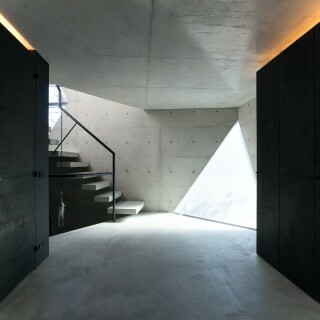 It is the only direction with a true feeling of the vastness of nature. 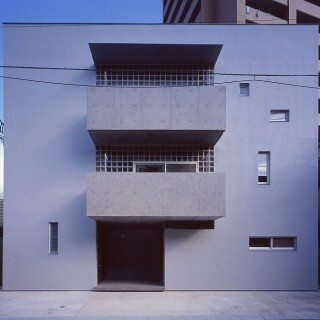 To form a strong connection with the sky, the corner of a rectangular building was pruned away at an angle. 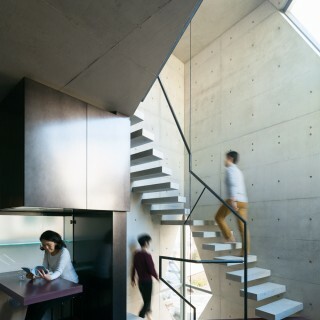 This action, cutting away the internal volume, paradoxically creates a sense of spaciousness in the continuous four story space inside. 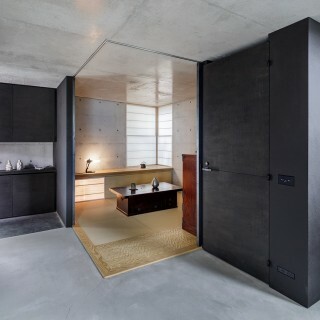 To secure a comfortable interior climate, a “thermal circulation system” was incorporated in collaboration with an environmental engineer. 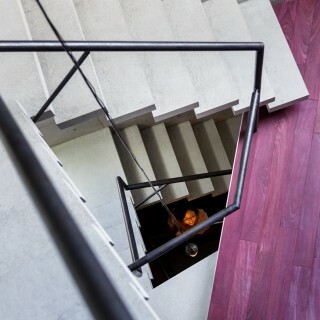 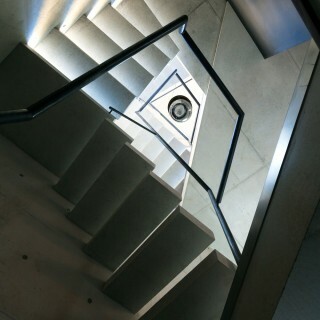 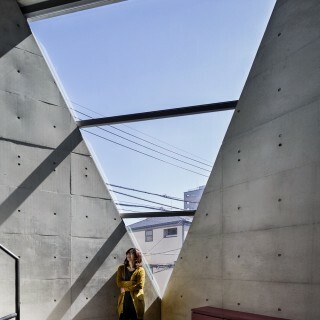 We developed a 100% recyclable concrete which, instead of sand, contains SHIRASU, the deposit of pyroclastic flow of volcanic ash which is found in the Southern parts of Japan in abundance. 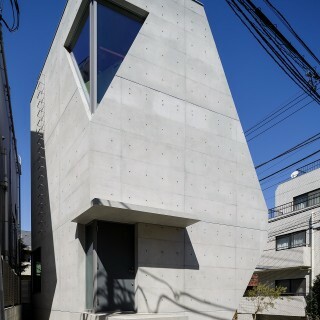 The advantage of this concrete is its strength and durability that increases to grow over a long period of time because of the pozzolanic reaction of SHIRASU. 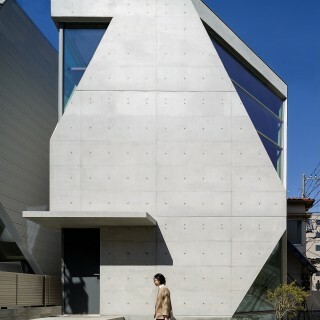 Also its density, which comes from the fine granularity of SHIRASU, protects the concrete from neutralization. 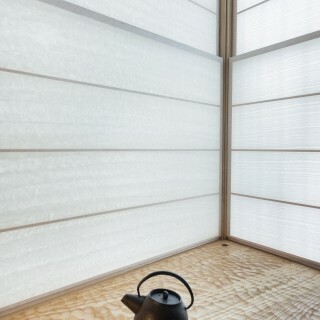 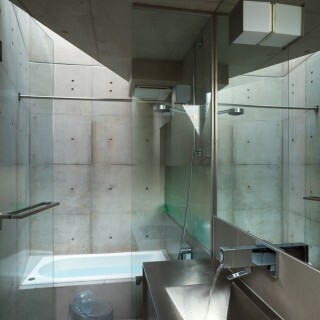 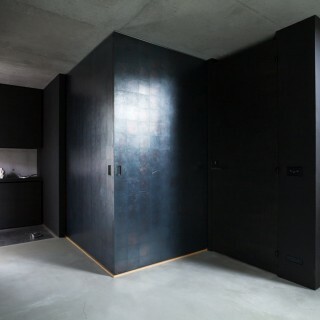 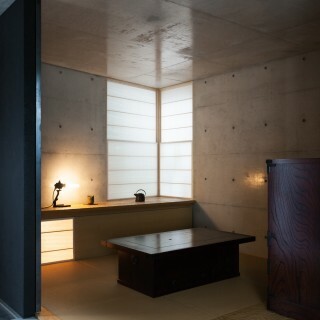 SHIRASU also contains micro closed-cells which gives the concrete humidity control and deodorizing qualities. 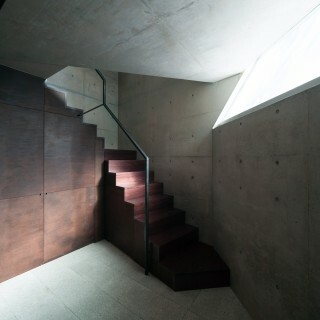 This development and use of SHIRASU concrete can be a huge asset to those areas where SHIRASU can be excavated. 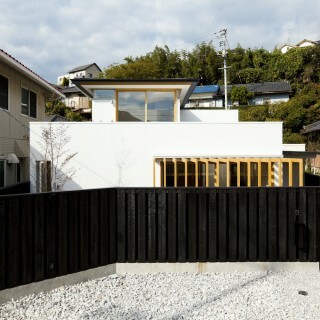 For architecture on a small site, sectional and volumetric design becomes very important. 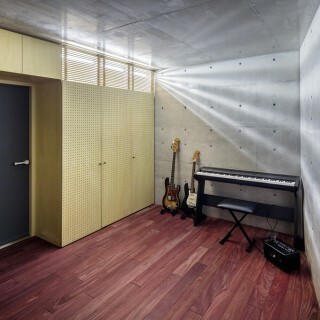 A high level sound insulated audio visual room in the basement, and a spacious gallery and a Japanese room is placed on the first floor. 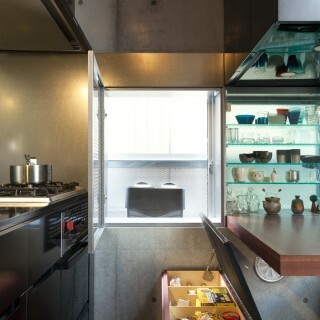 Functionality was prioritized on the second floor with a living room, dining room, kitchen and bathroom. 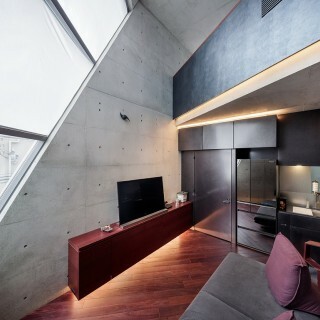 The living room is a very small space, but a 5m high ceiling and a large oblique triangular window, drawing in an abundance of external light, results in a cognition of spaciousness that is far greater than the reality. 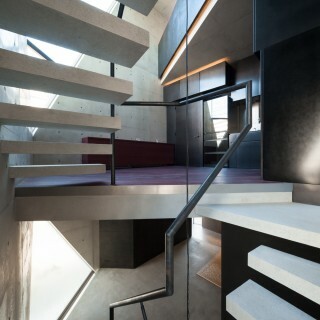 The final design of this space was derived through a vast number of three-dimensional models.